Two Russian cosmonauts will float outside the International Space Station on Wednesday (Aug. 3) to install an experimental laser-based communications system and release an amateur ham radio satellite into space. Cosmonauts Sergei Volkov and Alexander Samokutyaev are scheduled to exit the space station's Pirs airlock at 10:30 a.m. EDT (1430 GMT) to begin a six-hour spacewalk. It will be Volkov's third time working on the exterior of the station and Samokutyaev's first. Both cosmonauts will wear Russian Orlan-MK spacesuits marked with blue stripes. The duo's first task will be to release a boxy, 57-pound satellite, known as ARISSat-1 or Radioskaf-V. The satellite was designed and built by amateur radio operators to help drum up interest in scientific and technological careers among students. Students from all over the world also submitted images that currently stored onboard the satellite as part of its payload. The satellite will also collect readings from a sensor that is part of a Russian science experiment that aims to measure the pressure in Earth's lower atmosphere. The next major task of the spacewalk involves moving a cargo boom from one docking compartment to another. This laborious task is expected to take nearly three hours to complete. 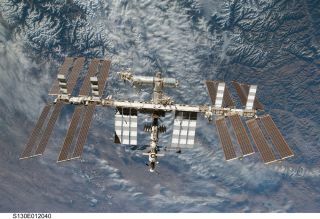 Once the cargo boom has been installed at its new location, space station residents will be able to use it like a fishing rod to move larger components around on the outside of the space station's Russian segment. Coverage of the Russian spacewalk begins at 10:00 a.m. EDT (1400 GMT) on NASA TV. Watch LIVE here.